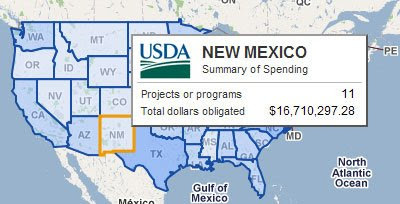 The USDA ARRA Projects Google Map shows the locations of United States Department of Agriculture projects funded by the American Recovery Act of 2009. More info about pdf vector format of a Free vector map USA, Adobe illustrator can be found here. The USDA say that they will also be adding United States Housing and Urban Development (HUD) data to the map as well. Is is possible to search the map by location, by agency or by funding amount. The map also includes some cool navigation tools, such as mouse-over state overlays and marker clustering. There is even the option to add your own comments on how your tax dollars are being spent.